Desalinated water from the plant at Wonthaggi is piped to Melbourne via an 84 kilometre underground pipeline. The pipe is made up of more than 6200 lengths of pipe with each pipe 1.93 metres in diameter, 13.5 metres long and weighing around 13 tonnes. 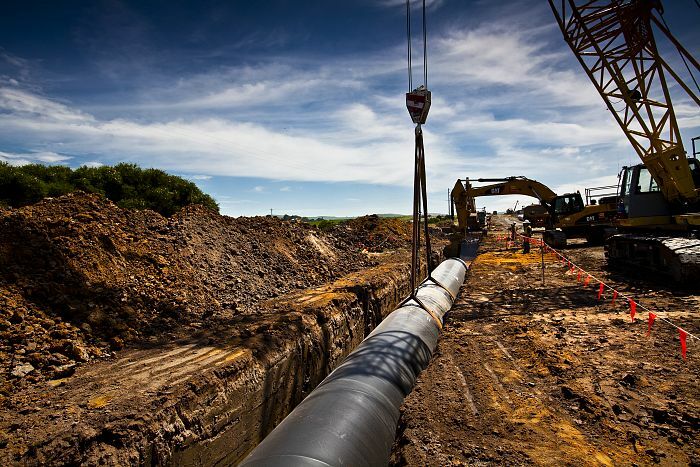 The pipeline is capable of transporting up to 200 billion litres of water a year and connects into the existing water supply network at Berwick. 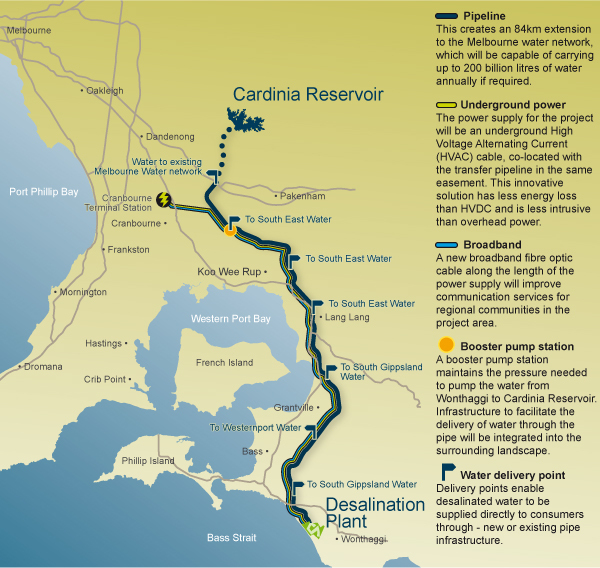 Seven water delivery points along the pipeline connect local communities to the desalinated water supply while a booster pump station at Cardinia helps maintain enough pressure to keep the water moving on its journey from the desalination plant to Cardinia Reservoir. The pipeline is two-way so it also connects some regional areas to Melbourne’s catchment supplies when desalinated water is not being used. An underground 220kV High Voltage Alternating Current (HVAC) power cable which is the longest of its type in the world is co-located with the pipeline to power the plant (all operational power is offset by Renewable Energy Certificates). Constructed as part of the project, the power line is now operated and maintained by SP Ausnet on behalf of the State. Underground power was the preferred solution for the project as it has the least impact on landowners and people living and working in the area. Fibre optic cables have been laid alongside the power cables and on the pipeline to allow communication of important monitoring information on the pipe and power networks. Additional capacity on this high-speed communications cable is available to facilitate improved broadband capability to surrounding communities subject to further development by state and federal departments responsible for telecommunications and infrastructure development. For further details on the water transfer pipeline and the underground power supply view the Pipeline and Power Supply fact sheet.